If your answer is yes or no, Vincent Bugliosi will prove you wrong. Vincent Bugliosi, whom many view as the nation's foremost prosecutor, has successfully taken on, in court or on the pages of his books, the most notorious murderers of the last half century -- Charles Manson, O.J. Simpson, and Lee Harvey Oswald. Now, in the most controversial book of his celebrated career, he turns his incomparable prosecutorial eye on the greatest target of all: God. In making his case for agnosticism, Bugliosi has very arguably written the most powerful indictment ever of God, organized religion, theism, and atheism. Theists will be left reeling by the commanding nature of Bugliosi's extraordinary arguments against them. And, with his trademark incisive logic and devastating wit, he exposes the intellectual poverty of atheism and skewers its leading popularizers -- Christopher Hitchens, Sam Harris, and Richard Dawkins. Joining a 2,000-year-old conversation which no one has contributed anything significant to for years, Bugliosi, in addition to destroying the all-important Christian argument of intelligent design, remarkably -- yes, scarily -- shakes the very foundations of Christianity by actually establishing that Jesus was not born of a virgin and, hence, was not the son of God, that scripture in reality supports the notion of no free will, and that the immortality of the soul was a pure invention of Plato that Judaism and Christianity were forced to embrace because without it, there is no life after death. 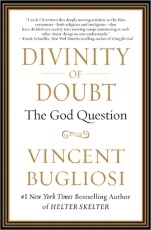 Destined to be an all-time classic, Bugliosi's Divinity of Doubt sets a new course amid the explosion of bestselling books on atheism and theism - - the middle path of agnosticism. In recognizing the limits of what we know, Bugliosi demonstrates that agnosticism is the most intelligent and responsible position to take on the eternal question of God's existence.